Published: May 12, 2011 at 04:30 p.m.
» Why are you wearing this number? Brett Favre has said that he is done with football (I'll believe that when I see it) and that he would like a chance to mentor new Panthers QB Cam Newton. Uh, no thanks. I would probably rather take a step aerobics class with Sergio Kindle. Besides, Aaron Rodgers did just fine without Favre's help. But would Favre mentoring Newton be the worst thing? Well, we thought of six mentoring programs that would actually be worse than Favre corrupting the youth of the NFL. Oops, I mean guiding the youth of the NFL. Smith has famously feuded with players and coaches, driving Drew Brees to New Orleans and then in 2010 keeping WR Vincent Jackson on the shelf in a contract dispute. But who can argue with the results? Second place in the AFC West is pretty good. Have a bad day at work? Things not going your way? Well then, let Stevie Johnson give you the proper perspective of a bad day, and realize that you do not need to be so serious. When it comes to scouting the next great wideout, nobody can beat Matt Millen who found Calvin Johnson. There is no need to talk about Charles Rodgers or Mike Williams. Kind of the way Jon Favreau is considered a comedy-writing force because he only talks about "Swingers," and never mentions "Made." Many applauded Barber for walking away from football with his health and dignity. Well, at least he still has his health to fall back on. Unless, of course, he makes good on his pledge to return to football. Though, in this economy, he's not the only retiree thinking about rejoining the work force. How can we condemn Mendenhall without hearing him speak? Oh wait, we did, and nobody wants to hear it again. 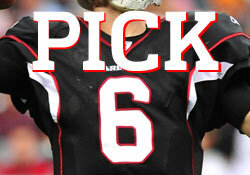 "Pick Six: Divas who need to go away..."